956 mm (37⁵⁄₈") 954 mm (37⁹⁄₁₆") 896 mm (35¹⁄₄") 1048 mm (41¹⁄₄") C B A Doors / Sliding // C8.4 6695 Business Parkway Elkridge, MD 21075 USA 1.410.796.6400 tel 1.800.645.0854 tel 1.410.796.0589 fax 1.800.348.2426 fax www.agam.com info@agam.com © Copyright 1998-2019 Agam Group, Ltd. All Rights Reserved, ATC-V09-C8-ENG (2019.01) R1 Sliding Door Track Reference: 171 LF Details: Parts shown below are for a 1MOC x 41 1/4" assembly. 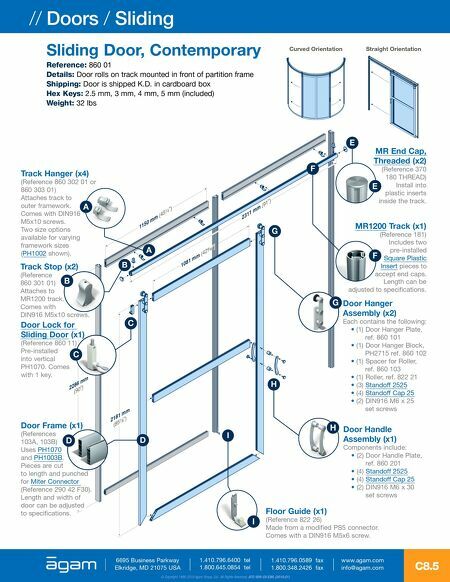 Each sliding door set requires a top and bottom track piece. Door panel must be 6 mm (1/4") thick. Accessories: Adhesive Door Pull and Sliding Door Lock are sold separately. A R1 Track (x2) (Reference 171) Shown installed in PH1005. When ordering, please indicate distance B as shown below. Adhesive Door Pull (x2) (Reference 918 CLEAR) Backing adhesive allows for mounting on smooth surfaces. Sold separately. 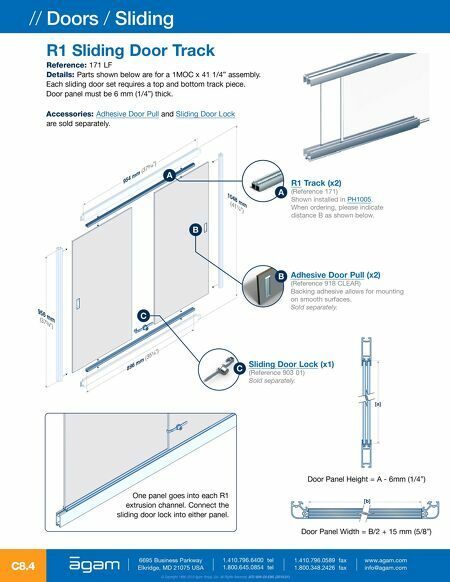 Sliding Door Lock (x1) (Reference 903 01) Sold separately. Door Panel Width = B/2 + 15 mm (5/8") [b] B C [a] Door Panel Height = A - 6mm (1/4") One panel goes into each R1 extrusion channel. Connect the sliding door lock into either panel.